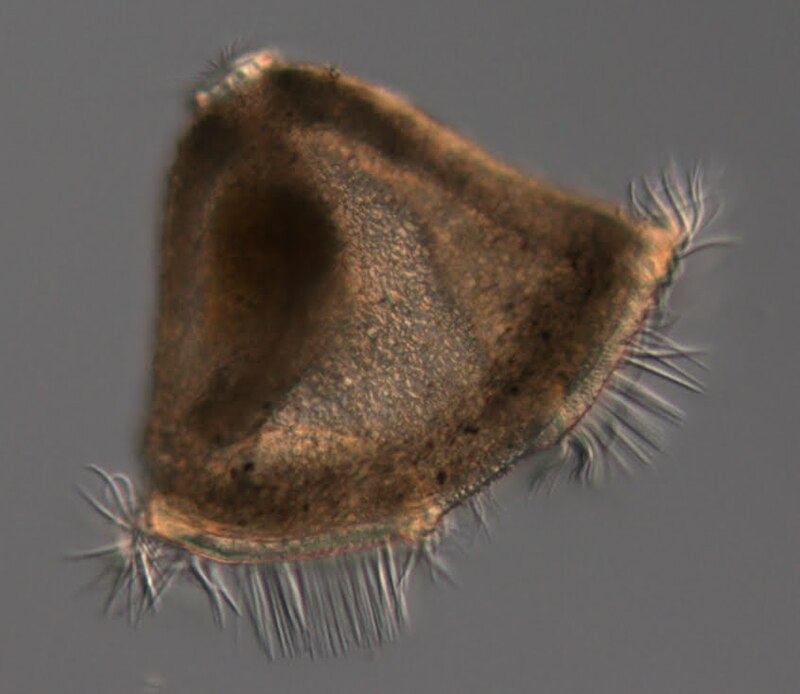 This cyphonautes larva belongs, I believe, to a bryozoan species from the genus Conopeum (Rafferty 2002). I fished it out from an otherwise remarkably uninteresting plankton tow off the F dock in the Charleston marina (Charleston, OR) on April 30, 2010. It is distinguished from other kinds of cyphonautes larvae by the relatively opaque triangular shell encrusted with small particles. Each valve has a characteristic curved lateral ridge. The darker mass inside is the gut. Cyphonautes is a planktotrophic larva. At the apex of the shell (top) is the apical organ. The long cilia of corona ciliata are visible at the base of the triangle. These are used to propell the larva through the water, and to collect microscopic food particles. Rafferty, K. 20o2. Bryozoa. In: An identification guide to the larval marine invertebrates of the Pacific Northwest. Edited by Alan Shanks. Oregon State University Press.